Tallest Single Residence, Tallest Living Wall, Tallest Garden, Most Expensive Residence and a Revolution in Skyscraper design are a few to put this new project underway in Mumbai. 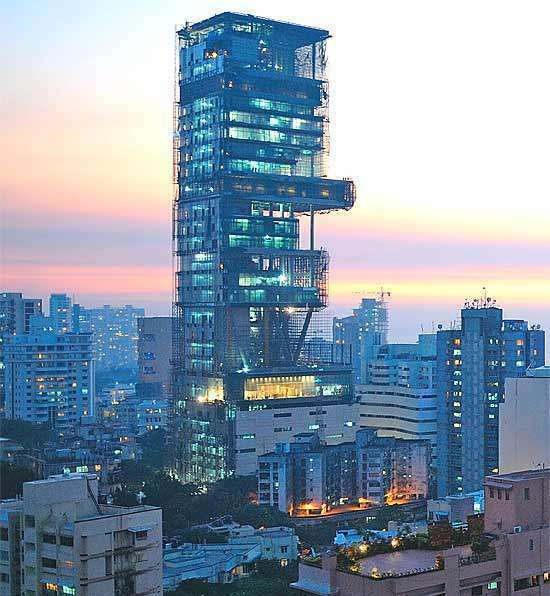 Estimated at over $1 billion Mukesh Ambani, Chairman of Reliance and India’s Richest Resident is building himself the world’s most expensive home called- ‘Antilla Residence’. Antilla Residence is designed as the largest and tallest “living wall” in the world — a seamless, vertical garden that encompasses all walls of the building climbing to the 40th floor. A modern day Hanging Gardens with a revolutionary design that stretches the boundaries of architecture and engineering, and questions traditional skyscraper design. The building’s height is significant. According to the plan, the house will rise to a height of 173.12 meters, equivalent to that of a regular 50-storied residential building. However, Antilla will have only 27 stories in all, which means each floor will have a ceiling considerably higher than the current average of nearly three meters. The design of the Residence Antilla, as it came to be called, was kept a close secret even after construction started in 2006. In early May, 2007, the architects released the building’s design to the public on their website. Designed by Chicago architecture firm Perkins + Will, the in-progress glass-tower is estimated at over $1 billion. Construction of Mukesh Ambani’s new house at Altamount Road in Mumbai, where real estate prices are now in the region of Rs 75,000 per sq ft, began in late 2006, and the first six floors are already in place. The building is expected to be complete in September 2008. The eighth floor will have an entertainment center comprising a mini-theater with a seating capacity of 50. The rooftop of the mini-theater will serve as a garden, and immediately above that, three more balconies with terrace gardens will be independent floors. While the ninth floor will be a ‘refuge’ floor — meant to be used for rescue in emergencies — two floors above that will be set aside for ‘health.’ One of these will have facilities for athletics and a swimming pool, while the other will have a health club complete with the latest gym equipment. There will be a two-storied glass-fronted apartment for the Ambani family’s guests above the health floors. One more refuge floor and one floor for mechanical works will be built on top of these apartments.